They say you’re either a bag or a shoe girl but I’m unashamedly both. I love beautiful shoes but I’ve also managed to build up quite a healthy bag collection as I think having a well rounded range of bags is one of the key things that can help make getting dressed easier. I have a few favourites that I turn to time and time again for various reasons and I’ve found that I’m currently in a great place style-wise as I feel I’ve got bags to cover every possible occasion. Here’s what’s currently on my go-to list. I use this if I’ve got a big day out planned and need to take a number of things with me such as if I’m running back-to-back errands or I’m with the girls. It’s a great size, and really well made so I feel confident I can pack several things in there and the tote will hold up. A black bag is an essential and I find this one to be particularly great as I can wear it as a shoulder bag and also as a clutch. The little strap you can put your hand through is particularly handy when I’m at an event as it makes it easier to carry the bag whilst juggling a glass or canape, or shaking someone’s hand. I’ve had this bag for a few years and love it for the fun appliques. I always tend to go for this bag whenever my outfit is quite plain and I need to dress it up a bit. 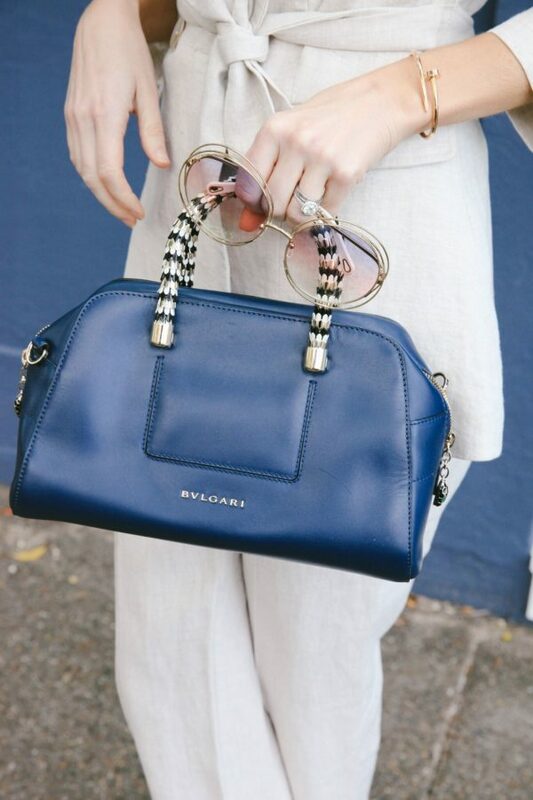 A good structured top handle bag is a classic staple. I always tend to use this bag whenever I’m wearing something quite dressy or ladylike. It’s always handy having clutches in key colours like black and a neutral shade. I have had this in my collection forever and have lost track of how many times I’ve used it. It’s a great size and a versatile colour and has definitely been worth the investment. This metallic pink bag has been ideal for events. It’s a great way to add a pop of colour to a look and it’s the ideal size for formal occasions. It also comes with a dainty strap so I can easily wear it as a clutch or a shoulder bag depending on my mood. If you don’t have a black clutch in your wardrobe that’s a serious gap that you have to fill! I cannot live without one because I use them for dressy events, work functions and even on days when I just want to downsize my essentials. This little number has had quite the workout this summer. It’s the perfect piece to wear with a casual look but it works equally as well with outfits that are dressy. Backpacks are so handy (especially when you’re a mum) and I can fully attest to the fact that I can’t live without mine. I’ve taken this bag when I’m travelling, when I’m with the girls or if I just want to go hands free for the day. It’s a classic style that’s able to work with various outfits in my wardrobe, so I definitely have been able to get plenty of use out of this bag. It’s a great size for carrying my essentials but also works well for a function. I’ve seen this tote pop up on a few Instagram posts and love its classic yet laidback vibe. This dreamy skirt is perfect no matter the time of year but crisp white and gold really does lend itself to a warm summer day. I love sunnies that are a little bit quirky and different and the octagon shape of this Chloe pair give them a point of difference to others in my collection. If you’ve yet to embrace beige tones prepare yourself because you’ll be seeing the colour everywhere. I love the playful meets classic vibe of this skirt. The interesting heel and shape of these mules caught my eye. I definitely like to intersperse my shoe collection with pieces that are a little unique. I’ve mentioned how much I rate this brand previously so you won’t be surprised that I immediately knew I had to have this particular one piece. It’s the kind of style that I know I’ll have for plenty of summers to come. A touch of metallic never goes astray. This bag is all kinds of fun and a definite talking piece. I’ve been trying to expand my belt collection of late and this style is ideal for glamming up a look. These heels tick the versatility box with their neutral colour but the shape and finishing details make them stand out in a crowd. If you’ve yet to embrace the humble hair bow then you’d better jump on board cause they’re going to be huge. This particular style would work with so many different outfits. You can never go wrong with statement earrings, especially when they’re such a great style and shape. This is a bit of a departure from the bags I usually go for but I couldn’t resist the interesting shape and texture and the standout colour. Headbands are always such an easy way to lift an outfit. I especially love the shell detail on this particular piece. I’ve been loving natural textures when it comes to bags, and this particular piece would get quite the work out over the coming weeks. 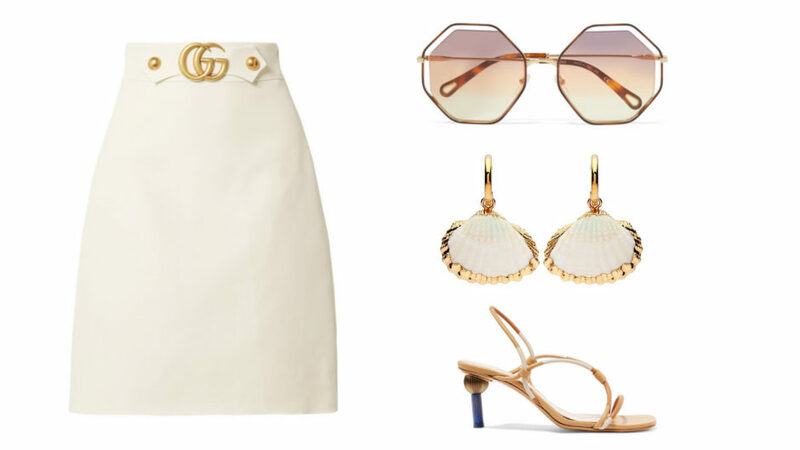 I’m making the most of the shell trend whilst it’s still here and love this cute pair for adding a little nautical element to an ensemble. Slides. They’re easily one of the most on trend footwear options for summer and are so wearable that if you haven’t stockpiled a few pairs already, you seriously don’t know what you’re missing out on. When it comes to slides I think the most important thing is to go for the colours that will easily work back with the rest of your wardrobe but it doesn’t mean you can’t afford to have a little fun along the way too. 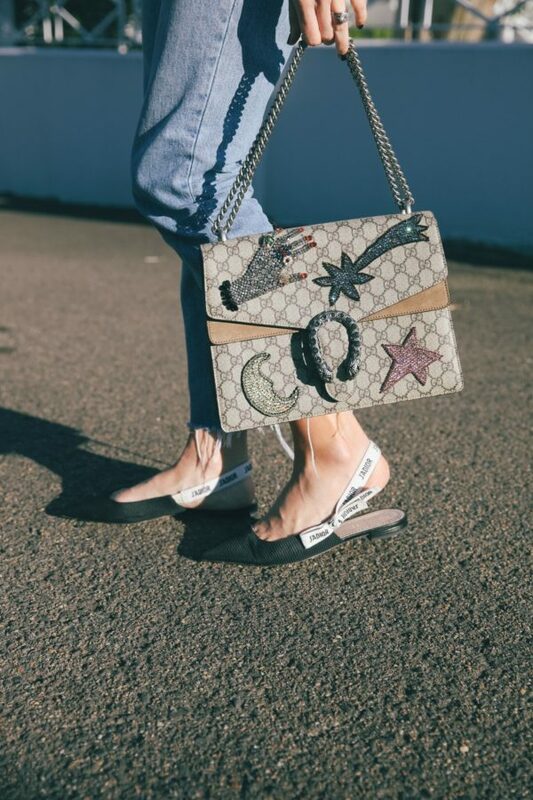 There are so many design options available, with everything from knotted straps to metallic detailing that will give your slides a point of difference. And if you’re in the mood to snap up more than one pair, then I highly suggest going for something that’s more of a statement piece to add a little drama to your favourite summer look. Take a look at the accessories you currently own and see what pieces you can use more often. You may find that there are things that you’d forgotten about or are back in fashion that you can include in your style repertoire more. Right now is the opportune time to snap up some new accessories for your wardrobe. There are some amazing things that have been marked down so it’s a good time to buy anything that you’ve had your eye on. If you ever spot something online that you really like but it’s full price, just be sure to add it to your wish list so you’ll be alerted if it goes on sale. The great thing about chain stores is that they interpret a lot of popular designer trends but at a fraction of the price. So be sure to scour your fave spots as you may find the perfect pair of earrings or the sunnies you’ve always wanted for less. Don’t laugh, but a quick browse through the teen or kids section of many stores may leave you pleasantly surprised. There are often on trend pieces that could easily work for your own wardrobe, but they’re priced cheaper. 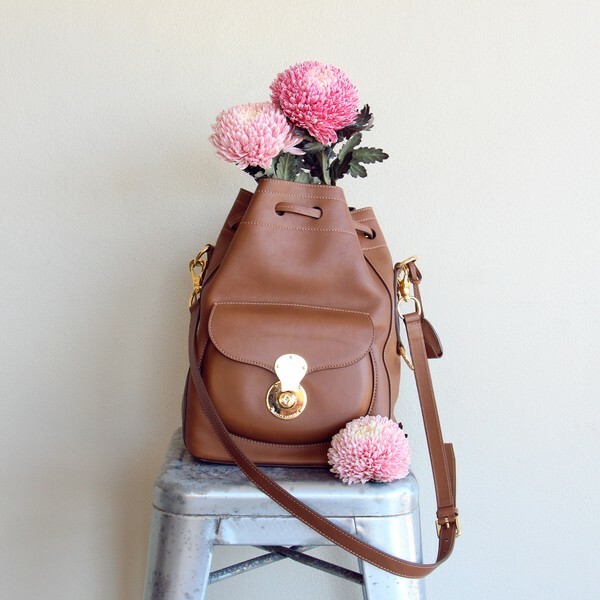 What are some of your favourite ways to accessorise on a budget? What’s better than a day at the beach with girlfriends? A great swimsuit is the lynchpin of your entire look so its worth getting it right. Invest in a good quality swimsuit that will hold up to numerous swims and constant sunscreen application without losing its shape or colour. Also try on lots of options before buying one as you want the most flattering fit – for example a bikini may be your go-to but you may discover that a one piece suits you phenomenally well. I always have a nice sarong, linen pants and denim shorts on rotation for when I go to the beach. I find all three work well with any swimsuit I’m wearing and help add a touch of polish to my overall look. I have a big sunglasses collection so I always just rotate them whenever I’m going to the beach. I tend to favour fun frames with a little colour or embellishment. Also this season scarves are one of the key accessories trends and are great for not only keeping your hair off your face but also look totally chic. If you want, you could also pop on a simple bracelet or a pair of earrings to dress up your look—just make sure they’re pieces you don’t mind jumping in the water with. Another must is a great hat to help protect you from the sun. A wide brimmed straw hat is a favourite of mine as it serves the practical purpose of providing shade but also, it’s a great way to accessorise a beach look. If you want a look that’s a touch more glamorous for heading out straight from the beach then be sure to come armed with a nice pair of sandals or slides rather than just your favourite thongs. Even if you’re heading out in the swimmers you’ve had on all day, great shoes can make all the difference and dresses up a look immensely. I also always carry a nice roomy bag with me to carry my essentials and this season there are so many nice options to choose from whether it’s a canvas bag or a straw tote. It’s the details that can really help finish off an outfit. Save a full face of makeup for a big evening event. Keep makeup subtle and to a minimum. Think tinted sunscreen, a little waterproof mascara and a swipe of blush with a dash of colour on your lips via lip balm or gloss. It’s about looking fresh faced not all out glamorous. Also it’s the ideal opportunity to skip your morning blow dry. Let your hair go au naturel and you’ll find by the end of the day you’ll end up with the best beach waves without having done much at all. Alternatively, top knots are always great for staying cool and keeping your hair off your face. And one thing I tend to do regularly in summer is get a fake tan whether I do it at home or go to a local salon. I’ll never lay out in the sun to get a real tan but I do love the bronzed effect of having one so faking it is by far the best option. I often think that the key to any party look is what you accessorise it with. And this is often one of the great ways in which you can recycle existing pieces in your wardrobe. By simply switching up your accoutrements, then you instantly have yourself a brand new look. One of the best and most wearable accessories to elevate any look (whether it be a party ensemble or just a casual look you want to give a little lift) is a pair of statement earrings. I often wear simple studs but for the times when I just want something a little extra to my look I definitely turn to my choice of earring. Often by wearing something bold and fun, you can instantly change the energy of an ensemble and give it a point of difference. And this season you’ll definitely be spoilt for choice. Because whether you’re after feathered and fun, colourful and bright or simply elegant, there’s definitely a pair of earrings to suit. It’s that time of year again where we’re juggling multiple social events from office Christmas parties to catch-ups over the holidays and gatherings with family and friends. This inevitably means having to get dolled up a time or two and if you’re not such a huge fan of heels then I do have another option for you: dressy flats. If you’re going to do flats to an event just be sure to be mindful of the length of your outfit to ensure it elongates rather than shortens you. So keep pants cropped at the ankle to show off the shoe whilst dresses and skirts that are knee length to midi length look great with a flat. If you’re going to do a mini it’s also a great shoe option as it helps to ground the look. Apart from that you’re good to go! I’ve embraced wearing flats to various occasions and I have to say it’s a game-changer. I can just get on with having a great time and not have to deal with aching feet throughout the course of an evening. And there are so many great options available out there that are on equal footing as some of the most gorgeous heels around. From those with dramatic embellishments to intricate detail and fashion forward shapes—there’s seriously a pair to suit any occasion. Like most women I’ve always had a huge appreciation for beautiful jewellery. I’ve always admired the craftsmanship that goes into each piece and also the story that each design tells. 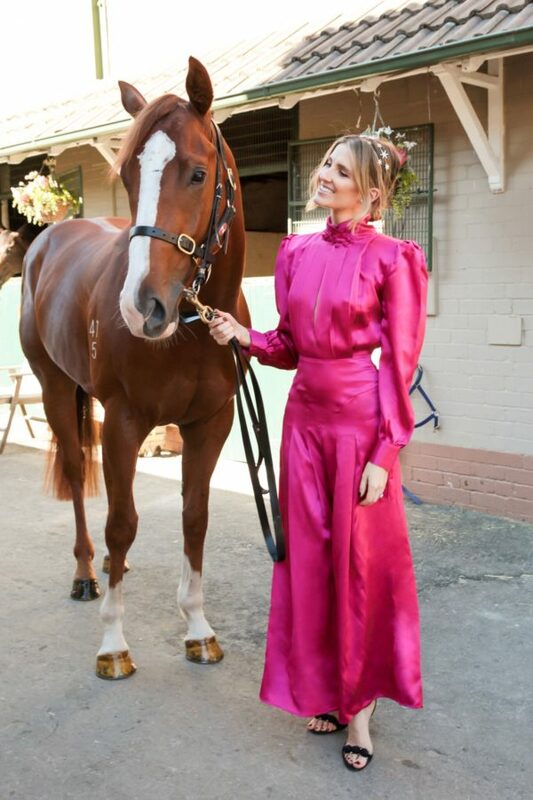 So I was thrilled to be able to work with French jewellery house Chaumet for the Melbourne Cup Carnival. Founded in 1780, it quickly became the official jeweller for Empress Josephine. Its collections today are still handcrafted in Paris’ place Vendôme, with each piece having a sophisticated and timeless Parisian sensibility. I wore Chaumet pieces for each of my looks for the key spring racing days and was spoilt for choice with Chaumet’s three unique universes to choose from. Each universe — Josephine, Liens and Jardins is a unique collection with a distinct aesthetic and personality. The Josephine universe echoes the history of the brand, with elegant pieces that are designed to make a statement. Jardins has a whimsical feel, incorporating a slightly more playful nature whilst Liens is about sentimental pieces that are designed to make special moments in life. I am the first to admit I had a ball picking out pieces but without a doubt the one I was most excited about was wearing the Josephine Aigrette Imperiale tiara at Derby Day. 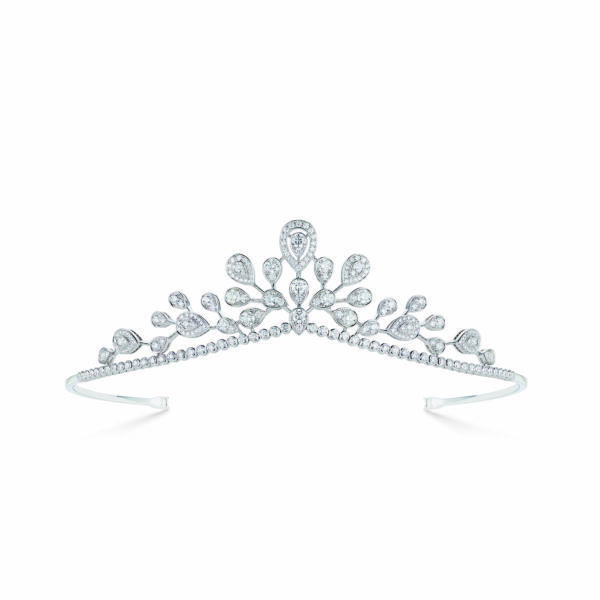 Chaumet is known as the house of the tiara, having created over 2000 tiaras since its inception, so I was in expert hands. The first time I tried it on I definitely had my very own princess moment. Images don’t do the tiara justice — it really was exquisite. Made of 18-carat white gold and dotted with 212 brilliant cut diamonds, it added a touch of sparkle to my monochrome look and was a definite conversation piece throughout the day. For Melbourne Cup, Oaks Day and Stakes Day I was able to wear a few pieces from the various collections, and each definitely gave my outfits a special touch. What I liked most was that each design was unique and had a standout element whether it be an interesting shape or a gorgeous stone and all elevated my looks — as only a striking piece of jewellery can. A great shoe is a must for a winning spring racing look, and zeroing in on the perfect pair every year is high on my list of things to do. I always take into account what will work with my outfit but also how long I’ll be able to wear them. The latter is probably the most important as per proper racing etiquette you should always keep your shoes on till the very end! 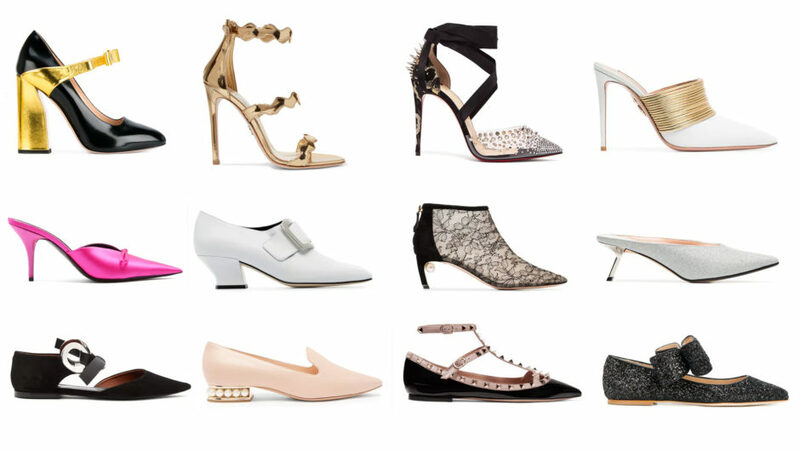 And this year, we’ve never been more spoilt for shoe options. There are so many designs around now incorporating everything from jaw-dropping embellishments, intricate detailing and all the colours of the rainbow. If you’re on the hunt for the perfect heel to match with your outfit, whether it be something vibrant for Melbourne Cup or elegant and monochrome for Derby Day, you’ve come to the right place. There’s no denying the impact of a statement heel. Plus let’s not forget the fact they gives you legs for days. If you’re going to rock a high heel make sure you break them in a few days beforehand to avoid any blister disasters. This is the comfortable option for those times when you want to wear a heel but can’t face a day in something sky high. You’ll still get all the benefits of a little extra height but it might be a little easier to manoeuvre your way around the track. In times gone by flats may have been considered to be a little too practical to wear to an event, especially the races but that’s all changed. These days you can now find a flat that’s as much of a showstopper as its heeled counterpart. And the best bit? You’ll be ridiculously comfortable the entire day. I’m all about a quick styling trick. If there’s something that I can do to my outfit that takes minutes but will do plenty to change its look and feel then I’m all over it. This is why this recent trend towards belting dresses is absolute genius in my mind. It’s something that you can do using an accessory that you more than likely already have in your closet and it will change the whole vibe of a dress. By simply cinching in the waist of an existing dress you completely change the shape, and also give it a strong focal point based on the belt that you choose. The thing with this styling trick is that most styles of belt will work. You could opt for a classic black belt with statement buckle to give your dress a little edge. A simple skinny belt will add a sophisticated touch to any frock whilst a chunky style waist belt will act as its own bold finishing piece. And it’s so easy. Just pop on the belt and you’re done. If you have a closet full of dresses that are currently putting you to sleep because you’ve worn them so much then consider adding a belt the next time you wear it. It’s an easy outfit refresh that won’t break the bank and that’s a definite win-win situation. Give a dress with a voluminous silhouette some shape with a waist belt that will instantly give you an hourglass figure. By simply adding a belt you can instantly give your dress a new focal point that changes its look and feel. You could opt for a belt with a statement buckle (the classic GG belt like the one above is a fave) to give your favourite dress an added lift. Tell me—have you jumped aboard this trend yet?